The course price is $375 per participant ($260 for a recertification) plus tax. 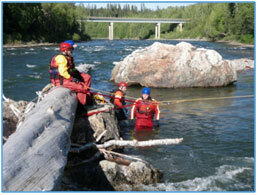 Additional costs: full PPE rental (drysuit, helmet, gloves, boots, PFD, throwbag) is $175 plus GST. By registering you agree to the cancellation policy below. Cancellation Policy: due to the amount of planning, preparation, and shipping of gear involved, we require a minimum four (4) days notification of cancellation before the outing in order to provide a refund. Extenuating circumstances may apply; please be in touch as soon as possible.